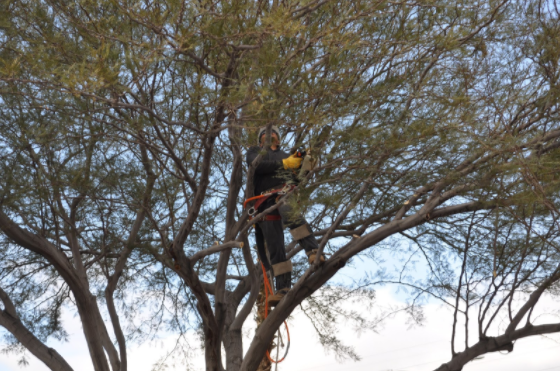 There are many reasons for tree removal in Las Vegas. The harsh weather can make it hard for trees to thrive without proper care. Technical felling is the term tree services use to describe the many ways crews use to get wood on the ground where they want it and when each and every time. Training is required to make sure trees, or sections of trees, fall where the crew wants during a removal. It is very dangerous to try to remove a tree or part of a tree on your own without this knowledge. If you have a tree you would like trimmed or removed it is always best to contact a tree service in your area to remove it safely. For safe tree removal or tree trimming in the Las Vegas area, please contact Nevada Tree service at 702-433-4700 for a free estimate.